One of the biggest challenges for any risk communications professional today is to deliver positive messages on pesticides. Like any communications process, trust is essential, but in a chemophobic world, trust in chemicals is a rare commodity. Pesticides found on the food the public consumes creates a vulnerability (fear) that cannot easily be overcome. People have to be convinced that their food is safe, any pesticide residues are of no risk and are there for a reason. In this case, we are asking a mother feeding her child to trust the chemical industry… a challenge indeed. It wouldn’t be half as hard were it not for the opportunists seeking to take advantage of a vulnerable population worried about their health and the environment. With social media networks making it feel like cancer is found in every spoonful, frightened consumers reach for their wallets and the dream of a chemical-free world. 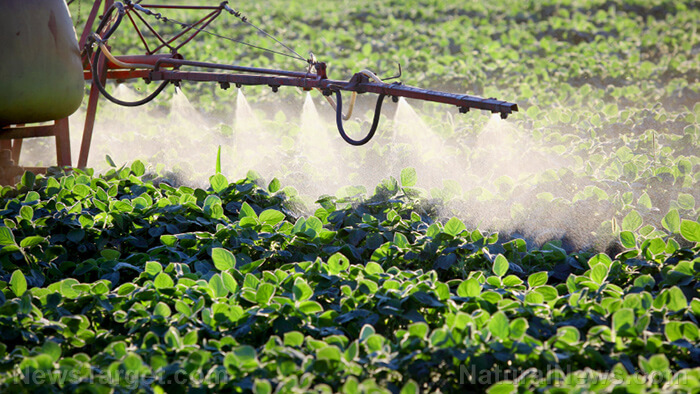 The narrative driven by the chemophobic activist community is that pesticides are dangerous to consumers, unnecessary and destroying the environment. They have left most of us thinking there must be some evil industry conspiracy wanting to pollute the countryside, poison children and profit from some intentional cancer plague. Anti-GM campaigners have recently shifted their strategy to focus on how seeds are bred to resist certain pesticides. The activist attacks on glyphosate were part of an anti-GM campaign. Their logic is clear: attacking golden rice or GM brinjal was not going to increase memberships or donations, but pesticides attract public fear with minimal effort. So for those taking up the challenge of getting the public to warm to pesticides (or pesticide-resistant seeds), allow me to catalogue what I feel are ten best practices. There have been mistakes in the past as there will likely be in future, but perhaps an open discussion is the best place to start. Don’t diminish how people feel frightened or dismiss their concerns: Scientifically literate individuals understand the insignificant levels of pesticide residues found on most foods, the comparatively high levels of hazardous natural chemicals and the decades of research that have gone into registration and compliance of all pesticides. But the public does not and they have been made to believe, most recently with the Monsanto Papers, that nobody knows with any certainty if any pesticides are safe at all. A scientist who dismisses their concerns, regardless how ridiculous they sound, is quickly dismissed. When people feel vulnerable, they seek out someone they can trust and who understands them. Don’t answer their questions with data, alienating chemical names or titles of important scientists or institutions. Try to put your answer into a personal story, compare the risk to an everyday exposure (like a cup of coffee) and try to demonstrate why farmers use these products. Anti-chemical gurus became popular because they understood and shared the vulnerabilities the public felt. Celebrate achievements: Higher yields, secure harvests, less labour: Malthus thought the world could not feed one billion people. Agri-technology has allowed man to feed an ever-growing population with higher yields and less input and this should be celebrated. 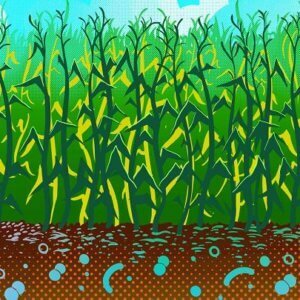 Man is a story-telling animal and the development of each pesticide is a story of how scientists were able to find a means to solve a problem and allow farmers to successfully bring a crop to harvest. Children in most countries no longer need to spend their summers pulling weeds. The best story to tell is one of food security: We no longer live in fear of major global crop failures – the technology is proven and trusted. 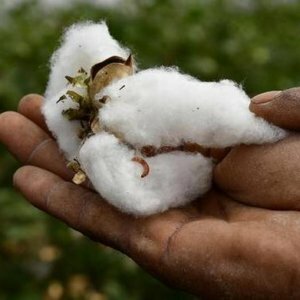 Make it clear that the natural vs synthetic source is not an issue: A dominant cultural narrative today is that natural is trusted. Organic food lobbyists like to claim their pesticides are safer because they come from a natural source. But the public needs to understand that all pesticides contain toxins that are used to solve specific problems (if they weren’t effective, they would not be used). Consumers must be reassured that all toxins used in crop protection, whether natural or synthetic in origin, have been well tested and are safe. The organic industry needs to behave in a more ethical manner here. Use precise terms when possible: Insecticide, herbicide, fungicide: The word “pesticide” obviously has a bad connotation. More importantly, it does not say what the substance does. An insecticide kills insects – insects eat crops. If the public has a better idea what a substance does, they can better accept its necessity. While we don’t want pesticides, we also don’t want insects in our food, weeds in our garden or moulds or blight on our plants. A precise vocabulary is essential in risk communications. Show why farmers use pesticides (benefits) and only when necessary: Farmers and farming are seen differently. 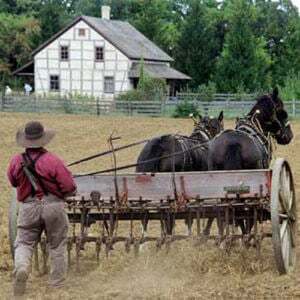 Farming is seen as a rather simple process: you plant a seed and in a couple months you take a harvest to market (… and I grew beans in my garden once!). Conventional farmers, on the other hand, seem to work for some industrial complex, poison the land and don’t care about public health. The organic food lobby bias that conventional farmers spray (douse, drench…) indiscriminately is inexcusable. The public needs to understand that farmers use pesticides only when there is a reason, at the lowest levels possible (it costs money) and with prevention in mind. There are clear benefits in using them. If a farmer could successfully grow crops without pesticides, surely he or she would. 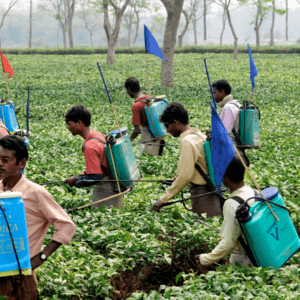 Present pesticides as part of a farmer’s toolkit used in difficult tasks: Integrated Pest Management (IPM) is a good example of how a farmer has many tools to deliver a crop to market, including pesticides. But these tools need to be of the best quality (farmers generally use the best crop protection tools available). Each time a pesticide is removed from the market (and this is happening in Brussels at an alarming rate), farmers have to look for alternative tools (often older pesticides with less sustainable profiles). The public, especially the media and policy-makers, have to understand that banning important farming tools is not necessarily a step in the right direction. Highlight the 50-year trend of lowering dose levels, better technologies: The first pesticides on the market in the 1960s were admittedly rather harsh (like any emerging technology). But over the last 50 years, scientists have worked to continuously improve agri-technologies (product stewardship), lowering dosages, reducing environmental and health impacts and providing better crop performance. Activists like to portray the industry with old images of crop dusters and military grade chemicals – they know the public might be attracted to advanced technologies. Precision agriculture is one such example of an attractive technology that could capture the public imagination if the story is told well. Demonstrate visually the volume of compliance research studies: The pesticide risk assessment process is not widely understood and trust in regulators is declining. Activists have made the process seem sinister: that a company puts a poison on the market with no data, and when cancers start to increase, the company then lobbies regulators to allow them to continue to make profits. If people understood the amount of testing and compliance measures required before a product goes on the market, and the levels of research required to keep it on the market, their trust in the process may improve. I often hear the terms “10 years and 10,000 pages” to describe how the risk assessment process works. That image needs to be visualised in a way to show the volume of work and research required to comply. Put toxicity into a banalising context: Most people are numerically illiterate (they buy lottery tickets to pay off their credit card debt). Expressing toxicity in terms of LD50s to a person who equates “chemical” with “cancer” is a waste of time. You need to put the toxicity into a context people understand. For example, if you get people to remember there are more carcinogens in a cup of coffee than in the pesticide residues of a year’s consumption of fruit and vegetables (Bruce Ames), they may begin to understand the risk a bit better (or stop drinking coffee). To say glyphosate has a very low toxicity is meaningless, but if you show how it is less toxic than ingredients found in chocolate or biscuits, maybe they will get it. I call this the banalisation of risk. Help people find out more information for themselves: An essential element of trust is agency. I fear flying more than driving my car to the airport because I know I am in control of the vehicle. If I can find correct information on pesticides myself I will gain my own understanding. Any communication effort should leave the audience with a means to find out more information by themselves. When I tell people there are more carcinogens in a cup of coffee, I ask them to Google “Bruce Ames + coffee + pesticides”. There is a lot of information out there, but people need to be sent in a good direction. A passive receiver hears information, an active one learns it. Related article: No-till agriculture offers vast sustainability benefits. So why do many organic farmers reject it? These 10 rules make communicating on pesticides seem easy. Of course anyone who has tried this challenging task will attest it is not. There are many clever and manipulative activists who are always one step ahead of you, using fear tools like children, bees and fear of cancer to undermine public trust. NGOs or social media gurus have no ethical codes of conduct restricting their behaviour (so their lies and fear-mongering can be justified in a sort of Machiavellian zealot ethics). Neither industry nor regulators can play by the same rules. An important element of trust is the messenger. An industry spokesperson is probably the least credible voice to deliver a positive story on pesticides. Farmers and scientists need to step up and be the story-tellers. They too will suffer from the continued aggressive assault on agri-technology. I am sure there must be ten more rules to add to this conversation and each pesticide or class of substances are different. Cultures have different perspectives (many languages consider pesticides as medicines for plants) and there are different levels of scientific literacy. One point is certain: we have a general idea today what doesn’t work when communicating on pesticides. Things can only improve… right? 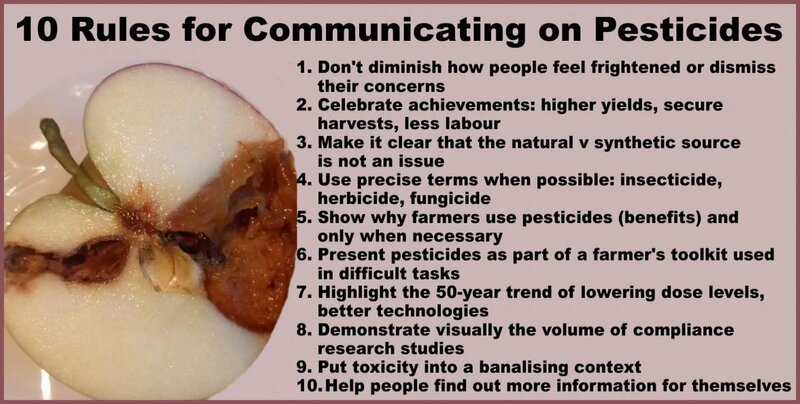 This article was originally published at European Seed as “The Risk Corner: Ten Rules for Communicating on Pesticides” and has been republished here with permission.